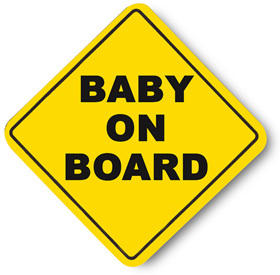 The rather time-worn yellow sign “Baby on Board” seen in the back window of vehicles is meant to encourage safe driving, but also is a public announcement of one’s new status as a parent (It’s also a pun referring to pregnant women commuters in London, as an incitement for commuters to offer their seats to pregnant women). In Australia, when I think of “Babies on Board” there is a poignancy and a deep and overwhelming sadness, because it evokes images of people seeking asylum via boat. The official term is “unauthorised maritime arrivals”, a dehumanising and bureaucratic term rather like the hardline policies of deterrence and detention. Abbott’s cruel “stop-the-boats” strategy ensures that maternity and infancy cannot be the celebrations they are in every culture. Mothers, babies, children and families will encounter the opposite of tender loving care at the hands of the Australian Government who will send them to detention centres in remote locations run by global companies including G4S, Serco and Transfield (See Cathy Alexanders Crikey post for more details). This outsourcing of misery costs the Australian taxpayer a load of money ($2.97 billion has been budgeted by the Federal Government (2013-2014) for detention-related services and offshore asylum seeker management while $19.3 million is allocated ($65.8 million over four years) for regional solutions). Consistent with other responses to asylum seekers in western countries, Australia has developed policies of deterrence and detention for boat arrivals without a valid visa. Australia’s Migration Act 1958 requires all “unlawful non-citizens” (people who are not Australian citizens and do not have permission to be in the country) to be detained, until they are granted a visa or leave the country. This detention policy was introduced in 1992 and continues until today. What makes Australia’s response to a legitimate right to seek asylum is the uniquely cruel policy of mandatory, indefinite detention and offshore processing. Without an age exemption it means that detainees can include families and unaccompanied children with processing taking months or years. A range of international literature shows that detention is highly distressing for both adults and children with long-term consequences. The majority of asylum seekers are found to be refugees under the 1951 Convention. Everyone has the right to seek and enjoy in other countries asylum from persecution. Article 14, Universal Declaration of Human Rights (signed by member countries in 1948, including Australia). The child shall have the right to adequate nutrition, housing, recreation and medical services. Principle 4. United Nations Declaration of the Rights of the Child. Proclaimed by General Assembly resolution 1386(XIV) of 20 November 1959. I am horrified that many new babies and new parents will be starting their lives in detention, the latter having already navigated treacherous borders, war strife and dangerous seas but now officialdom to meet the needs of their babies. Most of my professional career has involved supporting new parents. Aside from working on a postnatal ward, I helped to set up a service for women with postnatal depression in Auckland in the mid-nineties, my colleagues and I offered assessment, consultation and therapy to women. Aside from the hundreds of women I met I also heard many stories in the weekly support group I facilitated for depressed women for three years. My Master’s research considered the experiences of new migrant mothers and the challenges of establishing a new life without support and access to cultural rituals. In my PhD research I looked at the “the politics of the womb” and the role of maternity in projects of capitalism, nation building, imperialism and globalisation. See my other blog posts on supporting migrant fathering, ‘good’ mothering, pronatalist and antinatalist policies (including Australia’s forcible removal of Aboriginal – and some Torres Strait Islander – children). I’ve also researched and written about the experiences of Refugee women in New Zealand, Korean migrant mothers and the discursive repertoires of Plunket Nurses. I have spent decades educating organisations and professionals about the needs of new mothers and I developed a brochure about Postnatal depression for the New Zealand Mental Health Foundation with the help of consumer organisations and many new parents and professionals. So you could say I know a little about what new mothers and babies might need to help them thrive. Parenting and mothering are not easy. The transition is challenging emotionally, physically and socially. That’s why so many cultures have rituals for protecting and nurturing new mothers, whether it’s special foods, attention or ceremonies. The mother has experienced a massive transition requiring time to recoup, hence postpartum rest and loving attentive care are provided to women. Maternity professionals have a unique role in supporting the health and wellbeing of new migrant and refugee families, as they have privileged access to women at a time that is culturally and spiritually important to a woman and her family. However, women’s experiences of maternity services that are designed to meet their needs, can lead them to feel isolated, disrespected and invisible (and that’s when they aren’t in detention). Detention centres have been called factories for mental illness. The conditions in immigration detention are not conducive to establishing or maintaining family life, let alone helping families thrive. For asylum seekers who may have experienced torture or trauma, there is a vulnerable to experiencing mental health problems even before they reach countries of resettlement. The conditions of detention are demanding and difficult without the resources and support of family and friends, community and culture, no direct access to services and support. This situation is exacerbated by the unknown length for which people will be detained and to where they might be sent. It is further compounded by the punitive and coercive ways in which people are treated in detention. Existing trauma is only exacerbated while in prolonged detention which has an impact not only on the individuals in a family, but families themselves with the role of parent being undermined. Imagine powerless parents in unpredictable, hostile and degrading surroundings who cannot ensure their children’s safety or comfort. Yes, Australian policies of detention and deterrence are contributing to long term mental ill health for children and their families. Detention facilities have been criticised for the “culture of punishment, humiliating treatment of detainees, including children, and a failure to provide appropriate psychological support for high-risk populations”. In all actions concerning children … the best interests of the child shall be a primary consideration. UN Convention on the Rights of the Child (1989) – Article 3. .. a child who is seeking refugee status … whether unaccompanied or accompanied … [shall] receive appropriate protection and humanitarian assistance. UN Convention on the Rights of the Child (1989) – Article 22 . UN Convention on the Rights of the Child (1989) – Article 37 (b). Children subjected to abuse, torture or armed conflicts should recover in an environment which fosters the health, self-respect and dignity of the child. UN Convention on the Rights of the Child (1989) Article 39. Children, accompanied or on their own, account for as up to half of all asylum seekers in the industrialized world. Australia is not the only country to detain children, The United States, the United Kingdom, Germany and Italy also directly contradict The Convention on the Rights of the Child (UNCRC), which stresses that detention of children should only be a last resort and for the shortest appropriate period of time. In Australia up till 1994 there was a 273-day time limit on detention, however, after this time indefinite detention became the norm with no exemptions made for children or unaccompanied minors. 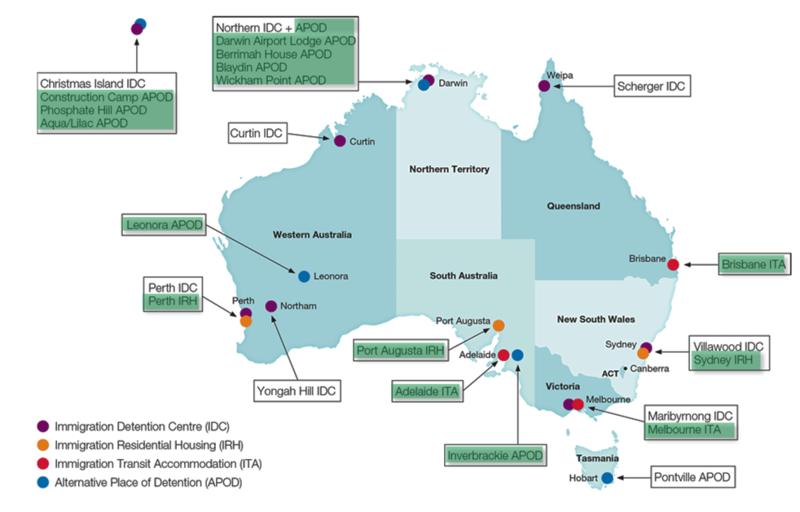 A Human Rights Commission National Inquiry into Children in Immigration Detention in 2001 noted that (CRC) requires the detention of children to be ‘a measure of last resort’, but Australia’s detention laws make detention of unauthorised arrival children ‘the first, and only, resort’. Mandatory detention overrides the rights and protections of child asylum seekers as enshrined in other international and regional conventions and declarations the European Convention on Human Rights, the Geneva Convention, the International Covenant on Civil and Political Rights, and the International Covenant on Economic, Social and Cultural Rights. 1816 children live in the community on Bridging Visas (their parents have no work rights and limited access to Government support). Babies are unable to crawl because the ground is so rough and the only playground is unusable during the day due to the extreme heat.New mothers are forced to queue up for strictly rationed nappies, baby wipes and powdered milk, with staff telling them constantly they will never be resettled in Australia. (Note that Section 21(8) of the Australian Citizenship Act makes clear that a baby, born in Australia, who is stateless, is eligible to apply for Australian citizenship). Louise Newman (see reference below) has worked extensively with women asylum seekers and notes that they have unique health and mental health needs related to pregnancy and delivery which can be exacerbated by limited antenatal care or screening. Their histories can include sexual trauma and abuse and perinatal loss. Receiving perinatal “care” in a detention facility means that professionals are balancing competing priorities and subject to varying forms of regulation and administration which put complex demands on their time. There may be ambiguity about how to respond to the needs of pregnant or postpartum women who they might be ill-equipped or resourced to support as reports have indicated. …what it is like being a new parent in a remote prison, with no control over your circumstances, every daily routine determined for you by guards and bureaucrats. We were told that there is 24/7 access to a nursing triage service, with a doctor on call, for asylum seekers (male and female, adults and children) in all three camps. We were also told that there are regular playgroups and ‘Mums and Bubs’ sessions held in all three camps for pregnant women and new mothers. Meeting individual asylum seekers, in the visitors’ rooms of all three facilities, in the two days following our formal visit, we heard stories quite different from the official accounts. We observed in many parts of the camps that asylum seekers including children and women are routinely listed, dealt with and addressed by the numbers given to them on arrival by boat in Australia, rather than by their names. the Government’s policy is to transfer illegal boat arrivals to offshore processing centres and families are transferred to Nauru. The statement says creating exemptions for offshore processing will only create dangerous incentives for people smugglers to fill boats with women and children. At a time when families should be focused on preparing for the joy of welcoming new life, they are instead dealing with the trauma of having fled from their home, the great anxiety of being told they will be sent to Nauru or Manus Island, and the daily despair of being kept locked up. (Note, if you’d like to support their work there are details on the DASSAN site). Chilout (Children out of immigration detention) have worked tirelessly to lobby for children aged from zero to eighteen. I recommend reading their Factsheet and accessing the extensive range of resources and reports on their website. The use of prolonged detention for pregnant women and mothers with young children inflicts physical and psychological harm disproportionate to the policy aim of immigration control and should be stopped immediately . The Royal Australasian College of Physicians (RACP) made a passionate plea on World Refugee Day for the Australian Government to end the mandatory detention of children and adolescents seeking asylum in Australia and in offshore centres. Their Position Statement Towards better health for refugee children and young people in Australia and New Zealand advocates for the abolition of Australian legislation that allows children to be housed in detention centres and they propose that the Australian Government immediately place detained children in the community with their families where they can be provided with appropriate health and social support. There is a Paediatrics & Child Health advocacy campaign for health and well-being of children in detention/refugees which was launched on 7 June 2013. Information and template letters addressed to Government Ministers can be used to advocate for health of children in detention. These are just a few of the national and local responses to mothers, children and families in detention. It’s not fair that children – or anyone for that matter – should be locked up for years on end, without any consideration of their claims to protection. It’s not fair that the conditions in offshore detention camps, overseen by our own government, are dangerous, inhumane and deliberately designed to break people’s spirit. And it’s not fair that Australia – ranked by the IMF as the 10th richest country in the world – should pass our refugee “problem” on to countries that are far poorer and less safe than many of the countries from which refugees come in the first place. Australia can do better than this. Over our history, we have led the world in protecting others in distress, and in improving the rights and living conditions of our citizens and those across the world. We should live up to our history. Kronick, Rachel, Rousseau, Cécile, & Cleveland, Janet. (2011). Mandatory detention of refugee children: A public health issue? Paediatrics & child health, 16(8), e65. Newman, Louise K, & Steel, Zachary. (2008). The child asylum seeker: psychological and developmental impact of immigration detention. Child and adolescent psychiatric clinics of North America, 17(3), 665-683.